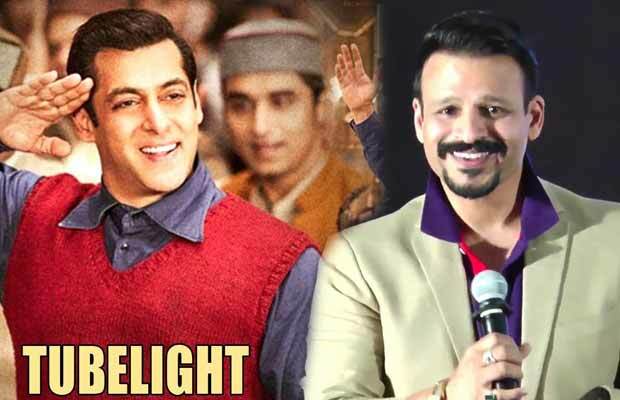 Vivek Oberoi Has Something To Say About Salman Khan’s Tubelight And Its Surprising! Bollywood actor Vivek Oberoi, who was once involved in a tussle with Salman Khan, is currently in all praises for the superstar. Remember how Salman Khan and Vivek Oberoi’s fight became a spectacle to watch for everyone after Salman made threatening calls to Vivek in 2003. Things went worst between the two actors when Vivek had organized a press conference at his residence against Salman Khan where he had said that Salman had threatened him. The duo avoids coming face to face and even avoids talking about each other. However, this time it was quite different. Vivek surprisingly replied to a question on Salman Khan. The actor said that he wants Salman Khan’s Tubelight to break records of Baahubali 2. Yes, he said that! “I want ‘Tubelight’ to break records of ‘Baahubali’ and become a superhit film. I feel ‘Tubelight’ has all the capacity to make Hindi cinema proud all around the world and I would like to wish all the luck for the entire team of ‘Tubelight’,” Vivek said on the sidelines of the Dadasaheb Phalke Academy Awards. The actor was honored for his contribution towards Hindi cinema and social work. That’s too cool of him! Well, just recently, Vivek also expressed his excitement for Salman’s Dabangg 3. At the recent event of his upcoming film Bank Chor, Vivek, who plays a role of the cop in the film was questioned something that hinted about Salman Khan. A journalist quizzed him asking do you like Tubelight’s (referring to Salman Khan’s cop act in the ‘Dabangg’ franchise) cop stint? Next articleWatch Video: Protective Salman Khan Secretly Asks Katrina Kaif To ADJUST Her Dress!